For reduction of most kinds of noise caused when equipments are connected. Ideal as an input transformer for a valve or transistor amplifier to provide a balanced, isolated line input which will then accept balanced or unbalanced sources of any impedance. Unbalanced to balanced conversion and vice versa. For use where it is important not to load the driving circuit. For helping to ensure Electromagnetic Compatibility (EMC) compliance. High level capability means it will not be overloaded in most applications. High impedance presents minimal load to a 10 KOhm source even at 15 Hz. Mumetal core for minimal harmonic distortion. 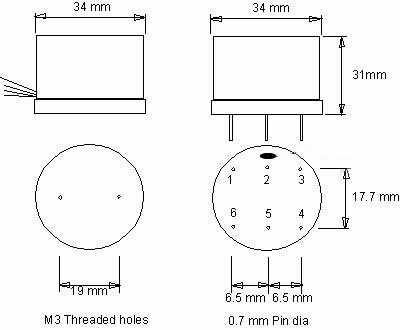 Internal electrostatic shield for high common mode noise rejection. Mumetal can for magnetic shielding. Secondary centre tap for phase splitting etc. Various package options.